JCU and the North Queensland Cowboys Rugby League Football Club have signed an historic agreement today to strengthen their already close ties. James Cook University and the North Queensland Cowboys Rugby League Football Club have signed an historic agreement today to strengthen their already close ties. Signing the document on campus in Townsville as part of JCU’s Orientation Week, the Memorandum of Understanding (MoU) formalises their collaborative relationship. For example, many high profile players have been, or still are associated with JCU. The Toyota Cowboys’ high performance manager, Paul Bowman, is a JCU sports science graduate, while the 2011 Cowboy of the Year, Ashley Graham, is currently finishing up his sports science degree and was a member of the NRL’s inaugural Academic Team of the Year. 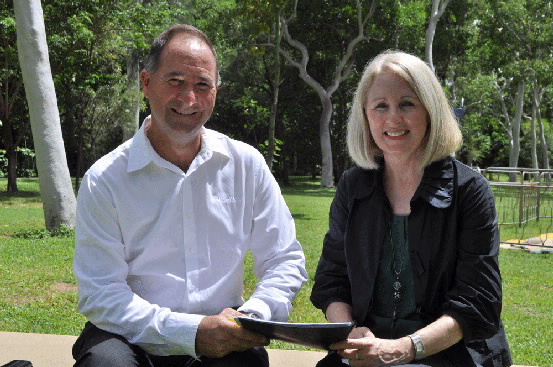 JCU Vice-Chancellor Professor Sandra Harding said the agreement would enhance mutually beneficial outcomes to benefit the broader Northern Queensland community. Both organisations had the skills, knowledge and the facilities to help each other, and the region, she said. “This agreement today is a natural fit for JCU and the Cowboys, who have been closely associated in many respects for several years,” she said. “It means we will work together, and with other stakeholders in the community, on issues and opportunities of a mutual interest to create lasting benefits for Northern Queensland and beyond. “We both want to foster a learning community, and identify opportunities to undertake research and development which benefits both parties. Cowboys Chief Executive Officer Peter Jourdain said rugby league in Northern Queensland had been enormously successful for a long time, playing a vital role in the identity of the region. “The game has gone from strength to strength and continues to be popular within the local community and business worlds, and the number of representative players to emerge from our local clubs is still increasing,” he said. Mr Jourdain said it was a great help to have access to sporting facilities at JCU, including access to the knowledge and expertise of staff and students. “Sports science is playing an increasingly important role in achieving the highest level of performance in all sports, especially rugby league. Mr Jourdain said while the Cowboys were obviously based in Townsville, they had strong support in Cairns as well. • JCU will feature links to the Cowboys on its website and encourage the continuation of sports science students working with the Cowboys coaching team. • The Cowboys will work with JCU to develop an exclusive category of membership for JCU students and staff and provide opportunity for JCU students to receive on-the-job experience in various operational areas within the club. • JCU students and staff will be offered ticket packages during the season, including a ‘buy one, get 2nd ticket for 50% off’ to coincide with university intakes. • JCU performing arts students will be offered the opportunity to perform at a selected number of Cowboys home games, which will be mutually agreed times. Mr Jourdain said it was anticipated that JCU students would also assist in the membership department in peak periods. “There is also opportunity for JCU research students to assist in preparation, collection and collation of results of surveys of the members of the Cowboys as well as the development of membership packages,” he said. A number of local high school students have also been offered places in the Cowboys Learn Earn Legend! program this year as well. The program aims to provide Indigenous students enrolled in years 11 and 12 at participating North Queensland schools with the support they need to complete their secondary education and move into further study, training or employment.